The seaside town of Bowen, is one of the few undiscovered tourist destinations on the Whitsunday coast. Situated close to Townsville, just 40 minutes north of the famous Airlie beach, Bowen is an ideal destination for lazy beach holidays. If you love the idea of a laidback vacation on beautiful beaches, away from the crowd, Bowen may just be the place for you. The combination of pristine beaches and glorious tropical climate makes a visit to Bowen worth your while. For a beach town overlooking the Great Barrier Reef, you may find the weather a bit dry. But the trade winds provide a pleasant breeze and make outdoor jaunts perfect. January is the hottest month, while July is the coolest, with the average maximum temperatures of around 31 and 25 degrees Celsius respectively. With its picturesque, palm fringed beaches, this is a tourist's paradise. Surrounded by ocean on three sides, Bowen is a peninsula. 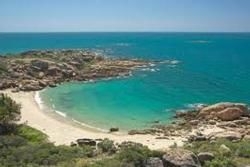 There are eight beautiful beaches around Bowen, which include Queens Beach, Kings Beach, the Front Beach, Murrays Bay, Horseshoe Bay, Rose Bay, Grays Bay and Coral Bay. Each beach has its own distinct character and allure. Horseshoe Bay is probably the most beautiful and well-known beach in Bowen. The soft sand, clear blue water and stunning graphite outcrops create a mesmerizing picture. The rock formations give Horseshoe Bay the feel of a private, secluded oasis. The place is rich in marine wildlife, making it ideal for snorkeling. The nearby islands of Stone, Middle and Gloucester are visible on the horizon from the Kings Beach. Here the mangroves of Magazine creek, clear water and granite boulders together create an amazingly contrasting sight. Queens beach is a good place to spot a nesting turtle during the turtle nesting season. This is another popular beach in Bowen. Tourists often stop here to relax and grab a meal. It also offers a nice park with a number of picnic tables. Rose bay is another great beach offering views of Middle Island and Gloucester. Murray bay, located between Rose Bay and Horseshoe Bay is ideal if you are looking for a secluded place to relax. Grays Bay is picture perfect with white sand, crystal clear water and lively colorful boats on its horizon. You can either spend your whole day lazing on one of the picturesque beaches or indulge in activities like cycling, snorkeling, fishing, cruising, crabbing, or swimming in the warm waters and exploring the Great Barrier Reef. Bowen is also home to the Big Mango, which is a huge mango artwork, located near the visitor information centre. The centre overlooks Edgecumbe Bay on the Bruce Highway. It offers a wide range of souvenirs, mangoes, local mango ice-cream, snacks, drinks and preserves. Depending on your budget and preference, you can choose from a wide range of Bowen accommodation options, including beachside holiday units, resorts, caravan parks, motels and apartments. If you want to take a break from exploring the town’s beaches, you can catch a movie at the summer garden Twin Theatre or buy some souvenirs at the town’s shopping centre.